St. Johns is located in North Portland and is bordered by Linnton, Cathedral Park, University Park, Portsmouth and Kenton neighborhoods. St. Johns feels very detached from Portland proper and has a distinct small town feel to it. The post office, coffee shops, breakfast places, restaurants, movie theaters, grocery stores, and several parks, are all within walking distance for residents who live close to the downtown strip. St. Johns has a rich and interesting history. An 1843 pioneer settler of Linnton, James John, moved across the river and started St. Johns in about 1865. St. Johns became part of Portland in1915, two years before Linnton joined the growing city. There used to be a lot of streetcars in St Johns and many interesting old houses & buildings still remain. It’s not possible to discuss St. Johns without singing the praises of the St. Johns bridge. The bridge is stunning and the focal point of many famous photos. It is often compared to the Golden Gate Bridge and mistakenly reported as being designed by the same person. The builder of the St Johns bridge was John Steinman who was rumored to be a rival to the builder of the Golden Gate Bridge. One virtue of the bridge that is often overlooked by much of Portland, is a 12 minute commute to downtown Portland and15-20minutes to Beaverton or Hillsboro. Highway 30, the road connecting the other side of the bridge to downtown Portland suffers very little traffic during the 8-5 or 9-6 commute hours (although, anecdotally, it’s busier during earlier hours 5-7 am and 2:30 - 4:30). Germantown road to Skyline or Cornelius pass dissimilarly light traffic during banker's hours commute. Community Photo Album - Come upload your photos! St. John's is described by locals as "extremely friendly", "A town within a city..." "There seems to be quite an underground of artists and fellow travelers in these parts." Some parts of St Johns feel new and others gritty and perhaps not so safe, especially at night. St. John's features all styles of Portland architecture, from ranches and cape cods, to the occasional Victorian home. St. Johns is an older Portland community. St. John's is home to beautiful Cathedral Park. The aptly named park, directly below the bridge is home not only to the “cathedral-like” arches of the bridge piers, but a boat ramp, a dog off-leash area, and a hiking trail. The park itself was created out of what was essentially wasteland under the bridge in the early 70s by St. Johns honorary mayor Howard Galbraith (per Portland Parks and recreation). There is a water pollution control lab that has a charming natural habitat wetland sanctuary where you may spot nutria and red winged blackbirds. The yearly St Johns blues jazz festival is also held in Cathedral Park. Forest Park has a trailhead on the west side of the St. Johns Bridge. You can walk across the bridge and be right in the forest. Forest Park is the largest old-growth urban forest in the United States. This trail area of the park features the most wildlife--you may spot some deer and other animals foraging quietly in the forest. The Smith & Bybee Lakes wildlife sanctuary is tucked away in St.. Johns, also. It's a protected wetland scenic area that is unique and beautiful--and a bird watchers delight! The Portland Parks website indicates that most visitors to the lakes can find beaver, river otter, black-tailed deer, osprey, bald eagles, and one of the largest remaining populations of Western painted turtles in Oregon. The Columbia Slough has boat ramps where people take canoes and rafts for a relaxing ride. There is public art along the restored trail. Pier Park is another great park that is like a little forest, and sometimes hosts classical music performances. Originally settled independently of Portland, St. Johns used to be its own city complete with City Hall. Now that building houses the police station, and the two towns are one. Or are they? Somewhere between the architecture that’s frozen at different moments in Main Street Americana and the fiercely, did I mention fiercely, proud neighbors and proprietors, is a sense of community that is different, special, even self-reflective. It's as if the community pastime consists of pinching oneself at the opportunity to live and work in St. Johns. Of course, some of the St. Johns’ satisfaction has to do with age. No rocket science here. Plain and simple, history equals roots equals pride. And in St. Johns, you can’t throw a rock and not hit something historic. Some of the oldest buildings in all of Portland are in St. Johns and some of the oldest businesses. The bike shop clocks in as the very first, established in 1925 and now in its third generation. The bakery is also in its third generation. The hardware store was the oldest in the land before hard times, but it’s making a comeback. 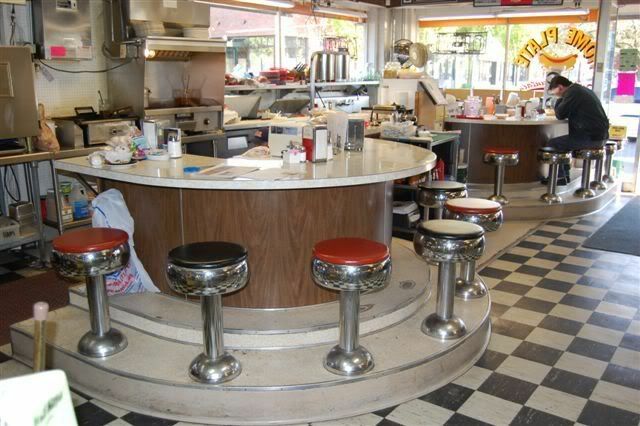 You can chomp on pizza at a gas station that goes back to the‘30s, and the soda fountain was flowing in the ‘50s. Most of the proprietors live nearby, and their sense of community weighs in far stronger than any feelings of competition. When you talk to shop owners in St. Johns, they can't wait to recommend several other shops on the block. They’ll tell you who owns them, how long they've been around, and the quality work they're up to. Taking their lead, here’s what we found. So this place isn’t the oldest in the' hood, but Gary Herrera, owner and Big Kahuna, does it the old fashioned way. He smokes and barbeques all his own meat right there on the premises. This guy with the huge, welcoming smile is so serious about barbeque that he holds classes and even barbeque competitions. The next one will coincide with the St. Johns parade that is the annual kick off to the Rose Festival season. Recently Gary’s won best caterer of the year, and the restaurant is listed as one of Portland’s Top100. He’s the champion of several competitions across the States. 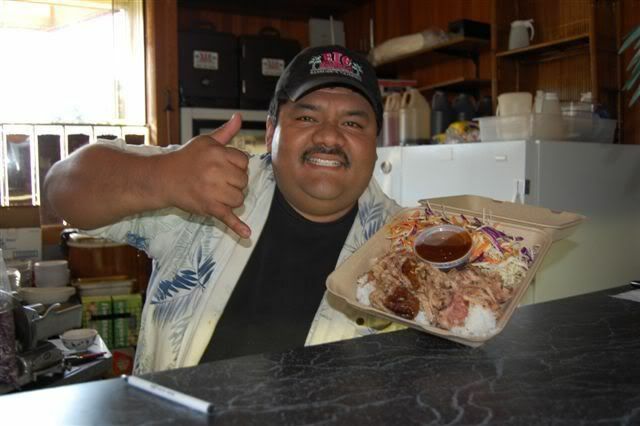 And with dishes like Kalua Pig Plate and Smoked Beef Plate with some Mango Cole Slaw, the Big Kahuna seems to have found the winning recipe for making a place in St.Johns’ history. The namesake proprietor grew up in St. Johns and used to spend her typical 1950’s Saturday sitting at the fountain here slurping Orange Julius. Two doors down, the owner of the fencing center says he’s seen a photograph of Pattie when she was a kid sitting at the tables and chairs outside – the exact same tables and chairs that are there today. All grown up, Pattie bought the place with her husband, Gene, and expanded the deli into a café. They serve exactly what you would expect they would in a place that still holds sock hops every first and third Saturday of the month. The antique gas pumps are still out front. The service bay door into the garage still rolls up. And inside, what else? Pizza! You can enjoy the warmer months inside the “garage” or at tables set up just outside. And word on the street is they’ve got good rep. 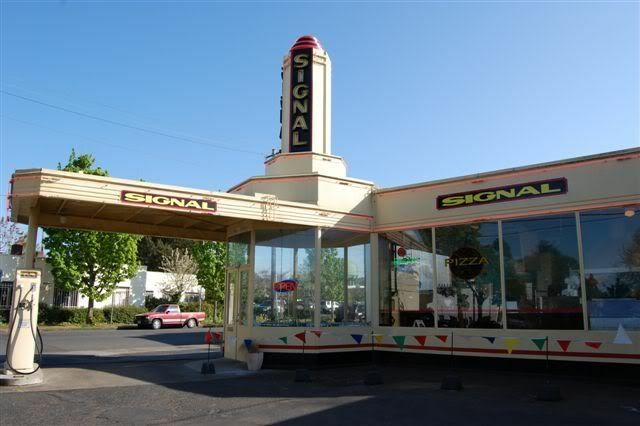 Serving pizza by the slice or whole pie, Signal Station also makes sandwiches and salads and scoops up Blue Bunny ice cream. In the market for that latest digital SLR? Or maybe you're just in the mood to talk mega pixels? Not in St.. Johns you’re not and certainly not at Blue Moon. Purists down to their last shutter, each and every Blue Moon staff member is a photographer first, clerk second, and they do traditional film the traditional way. On the equipment sales’ side of the business, they carry the best vintage: ‘60s, ‘70s, and early‘80s. And processing Blue Moon style means high quality optical printing that requires hands-on, one negative at a time attention, focusing optical light through each individual frame. 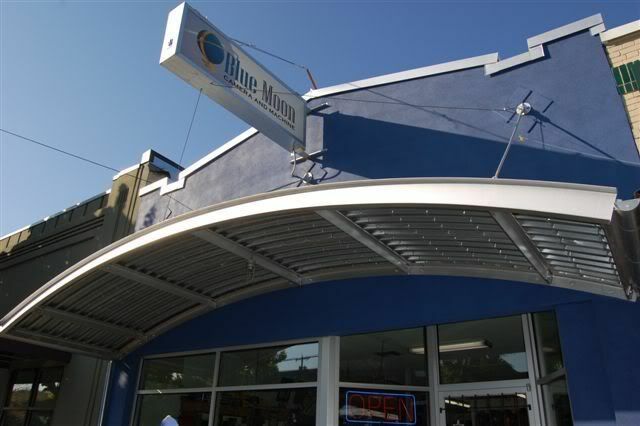 In addition to keeping tradition, Blue Moon has also made one in these parts. As they see literally every exposure their customers submit, the staff sets aside a few favorites for an annual customer show that has become so popular that this year there's an encore presentation. The name doesn’t give away much, but a simple title would have its hands full trying to nail down this store's contents. Instead of slinging the shopping "E" word – “eclectic” – manager Michael Talley refers to the establishment as an “all inclusive gift shop.” Cards to fountains, the inventory will soon also boast a nursery with garden supplies and garden art. “Meet us and be well dressed,” was the slogan started 67 years ago by Ben and Jean Leveton. 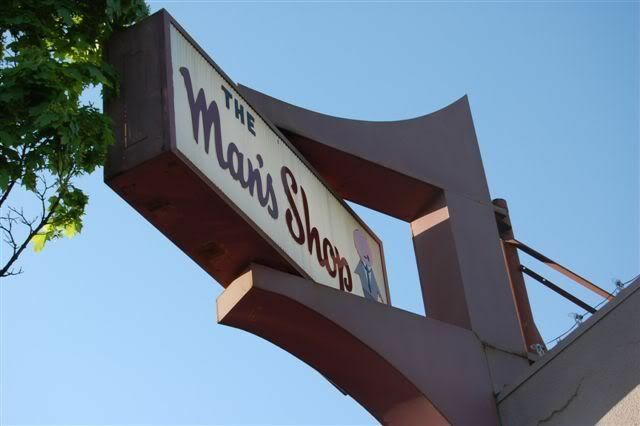 Their sons, Bob and Jerry, have run the operation for many years now, and The Man's Shop remains the place for smart attire, as well as casual, in the neighborhood that made them who they are. Though the family has always had a St. Johns presence, once upon a time they also owned a second location in Jantzen each. There they won the “Friendliest Store in the Shopping Center” so many years in a row that the trophy was finally retired with their name on it. What bearing does that have on their business today? According to the brothers, they learned what it meant to run a truly friendly shop from St. Johns– and that’s right where they continue to do so. Suits, shirts, ties, tuxes, and even tee’s and jeans, The Man’s Shop has a tremendous inventory in addition to their share of smiles. 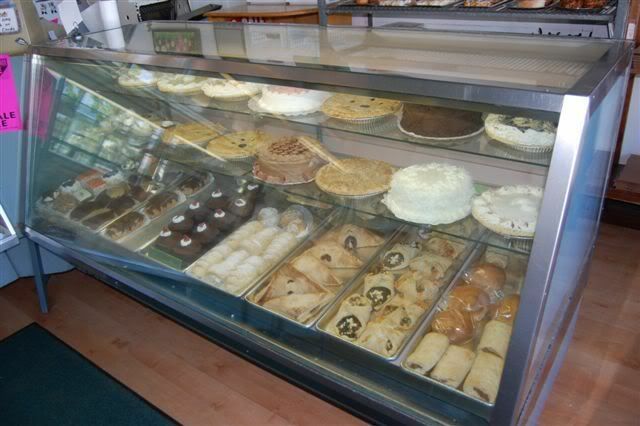 Making St. Johns smell good since 1950, Tulip Pastry Shop still bakes every last morsel like they did 57 years ago –from scratch. In the business for so long, Melodie Presler of its third generation can’t smell any of her family's sweeter concoctions anymore, but it's worth it for cakes that are legendary, custard – also from scratch – that is a conversation piece, and a Marionberry stuffed cookie that will demand your complete attention. They like the old sound, and they like the old way. Pat likens their store to any mom ‘n pop shop you'd find in the 50s. And why shouldn’t she? Doing it the vintage way, her commute consists of walking and waving to the neighbors who frequent the shop so often they have their pictures, like family, hung in a collage on the wall. Before biking was Portland chic. 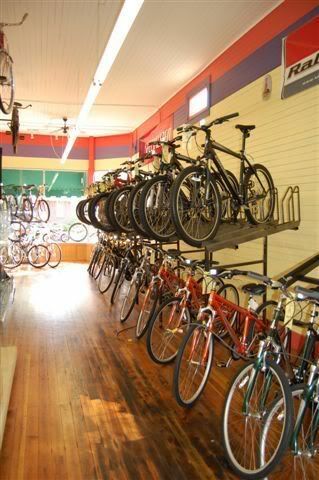 Heck, practically before God created the seventh day so that the entire city could go biking – there was Weir’s Cyclery. Saddling bipeds on two wheels since 1925, Weir’s is the oldest in the city. Passed from father to son a couple of times, Weir’s is in its third generation with Steve, who specializes in Specialized and Raleigh, and of course the traditional Red Line for the BMX crowd. In reality, not a word needs to be written about these folks. They’ve been thriving for 82 years in the crazy obsessed Portland bike culture. ‘Nuff said. A classic sport for a classic neighborhood –it’s a classic fit. 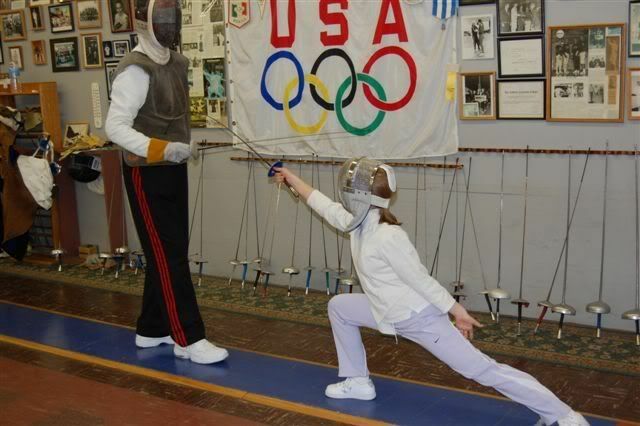 Coach Rocky Beach and Maitre d’Armes, Delmar Calvert, who received his first fencing master's degree while serving in the French Foreign Legion, offer traditional as well as Olympic-style sport fencing training for both genders, all ages. The story goes that Coach Beach used to live in St. Johns in its earlier heyday and believed it would be the right spot to which to return to establish his beloved fencing center. At that time, however, the area had suffered a few setbacks, and his shop lights were the only ones on the street still bright come nighttime. But Rocky believed if he just kept those bulbs burning, other proprietors would eventually come. Suffice to say that Kevin Costner and a cornfield have nothing on Rocky Beach and Portland’s St.Johns neighborhood. St. Johns Theater -- Not to be confused with the McMenamin's Theater and Pub. This awesome old movie house serves pizza and beer, good coffee and general movie snacks all for prices you don’t find in movie theaters. There are theaters up and downstairs but potential patrons should take note that the top theater screen is much smaller and the seating a little awkward. The bottom theater is stunning and every seat is a good seat. Thanks to our contributing authors to the St. Johns page, local residents Kelly Tadlock and C. Smith. Have something to share about this Portland neighborhood? 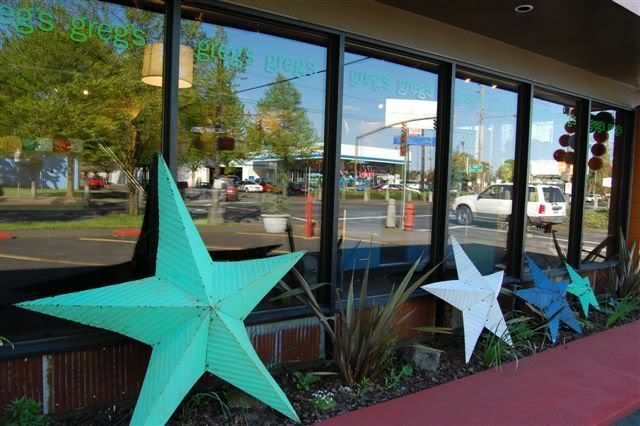 Do you have a great neighborhood story, restaurant review, photo, business listing, tip, or other information you would like to share about this great Portland neighborhood? Share it with your neighbors! Enter a title for your neighborhood business listing, review, neighborhood story, or tip. Entering your neighborhood information or story is easy to do. Just type it! Your story will appear on the web page exactly the way you enter it here. Tip - You can wrap a word in square brackets to make it appear bold. For example [my story] would show as my story on the Web page containing your story. 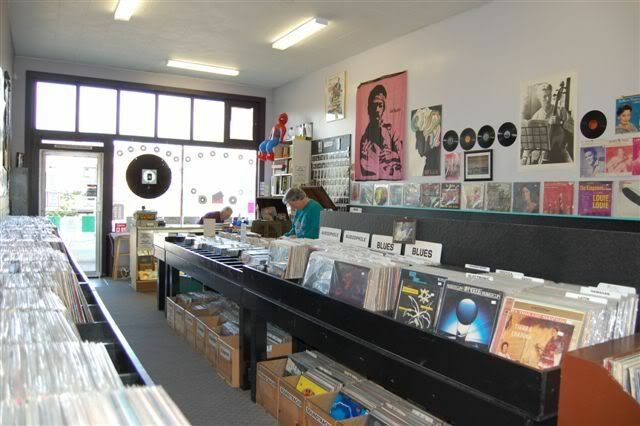 Do you have a Portland neighborhood picture to add? Great! Click the button and find it on your computer. Then select it for upload. Note: The maximum image size accepted is 800x600. Resize any photo larger than 800x600 pixels using graphics software or a Web-based resizer, such as Google's Picasa for PC users or iPhoto's Export function on a Mac. You can also visit http://www.shrinkpictures.com/ and shrink your photos for free on their website. The St. John's Parade has an official web site now at http://www.stjohnsparade.com Check it out.